Three out of eight Monetary Policy Council (MPC) members voting in favour of a 25bp rate hike at today’s Bank of England (BoE) policy meeting. 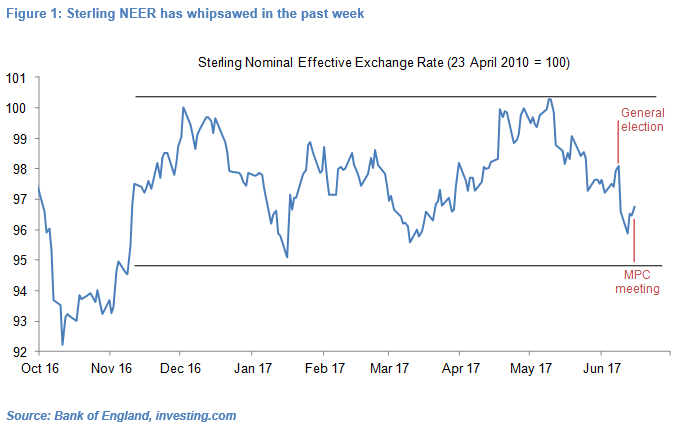 Signs that Theresa May’s cabinet is close to reaching an agreement with the DUP which would give the government a 13-seat working majority and may be willing to soften their take on Brexit and fiscal austerity measures have seen Sterling slowly recover since 12 June. Today’s MPC meeting, for which the consensus forecast was that Kristin Forbes would remain the lone dissenter in favour of a 25bp policy rate hike (to 0.5%), has seen Sterling’s rally slightly extend. The two parties share little in common bar their desire for Northern Ireland to remain part of the UK and for the UK to exit the European Union (EU). Even the issue of Brexit poses problems as the government’s wish for the UK to leave the European Single Market is potentially at odds with the DUP’s wish to maintain borderless trade between Northern Ireland (which is part of the UK) and the Republic of Ireland (an independent state which would remain part of the EU). Moreover, this alliance may reignite tensions between Irish republican and unionist parties, potentially jeopardise the British government’s impartiality in Irish matters and in a worst-case scenario threaten the Irish peace process. The longevity of such an alliance therefore remains in doubt. 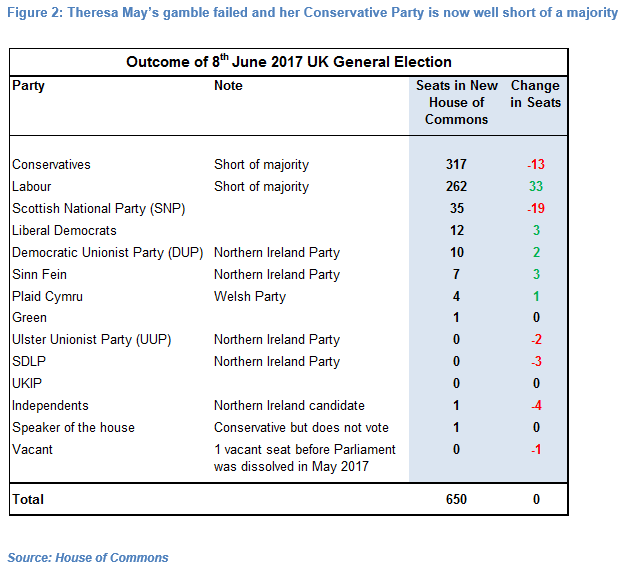 Should it break down, the opposition Labour party, which won 262 seats, would try to form a ruling coalition with the SNP (35 seats) and Liberal Democrats (12 seats) but with 309 seats would still be well short of a parliamentary majority (see Figure 2). The more likely outcome in such a scenario would be the prospect of yet another destabilising general election and compounded political uncertainty. 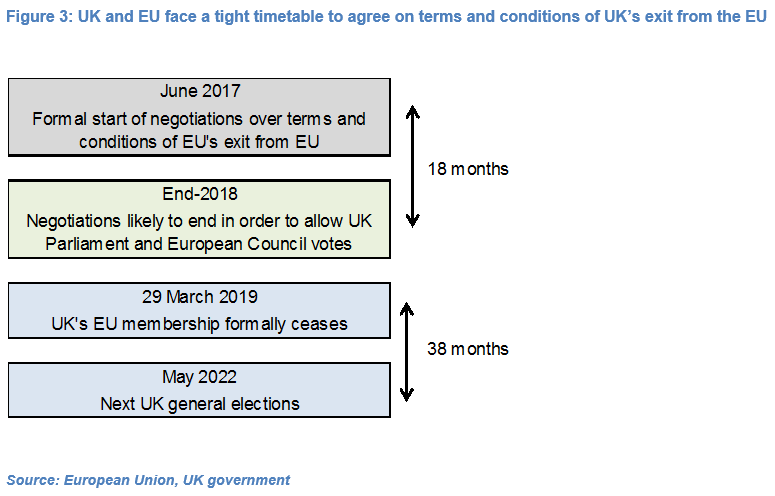 With the UK officially due to exit the EU on 29th March 2019 (see Figure 3), the debate over the terms and conditions of a new deal between the UK and EU has hogged the headlines for the past 12 months. But there is seemingly still little consensus within the government, parliament and voters on whether the UK should and will opt for an “Ultra-Soft Brexit” (i.e. ongoing membership of the Single Market), “Soft Brexit (i.e. ongoing membership of the Customs Union), “Hard Brexit” (i.e. exit from the Single Market and Customs Union), a temporary deal or, in an arguably more extreme scenario, walk away from a deal and revert back to WTO rules (“Ultra-Hard” Brexit). In the wake of the Conservative’s loss of a parliamentary majority and its dismal election campaign, there are signs that the government may be willing to soften its hard stance and opt for a softer version of Brexit, which businesses and financial markets seemingly favour. Even the possibility of the UK reversing course, annulling the triggering of Article 50 and remaining in the EU (albeit with a tweaked deal) has re-surfaced in recent days, with a number of EU leaders having left this possibility on the table. However, this pressing question is likely to remain unanswered for now as the focus of UK-EU negotiations in the next 6-12 months will be on the terms and conditions of the UK’s exit from the EU, not of the UK’s potential new deal with the EU. While the two issues are somewhat inter-connected and could at some stage start to be discussed in parallel, the EU has from the start been inflexible on the issue of sequencing. Their position that discussions on the UK’s departure from the EU will have to precede discussions on a potential new deal with the other 27 EU member states is enshrined in Article 50 of the Lisbon Treaty which the UK signed up to (Clause 2 states: “the Union shall negotiate and conclude an agreement with that State, setting out the arrangements for its withdrawal, taking account of the framework for its future relationship with the Union” [my emphasis]). Even if the EU were willing to prove more flexible, both parties face a narrow timeframe which from a practical perspective likely precludes complex and likely drawn-out negotiations over a new deal starting (at best) before 2018. Baring a unanimous decision by the UK and European Council to reverse the triggering of Article 50, the UK will formerly leave the EU on 29th March 2019 (see Figure 3). As the British and European Parliaments and European Council will need time to vote, the UK and EU will realistically only have until end-2018 to finalise the terms and conditions of the UK’s exit from the EU. Assuming that negotiations start as planned on 19th June – and even this timeline may slip – the UK and EU will at best have only 18 months to agree on major and complex issues such as the UK’s “divorce” bill, the status of UK/EU nationals in the EU/UK and the European Court of Justice’s say in British matters. Therefore, in coming months the focus is likely to be on these issues rather than the economic, financial, political and legal intricacies of a new UK deal with the EU – a likely source of uncertainty and disappointment for voters and financial markets alike. The consensus forecast for today’s meeting was that the MPC would again vote by seven to one in favour of rates remaining on hold at 0.25% with Kristin Forbes, arguably the most hawkish MPC member, once again dissenting in favour of a 25bp rate hike. She did but was joined by Ian McCafferty and Michael Saunders (see Figure 4), which has left markets pondering as to whether a rate hike is round the corner. While the MPC statement remained balanced, there was a shift in tone with greater emphasis on weak sterling still feeding through to imported inflation, headline inflation above the BoE’s target, a tighter labour market, resilient consumer confidence and spending and a pick-up in exports. Reading between the lines, the concern is seemingly that higher inflation will eventually feed through to inflation expectations, wages, consumption and growth which would in turn exacerbate inflationary pressures. I do not see a strong case for this pass-through due to weakness of the economy (see below) and more importantly I do not think that any of the other five MPC members see any imminent risk of rising inflation becoming self-sustaining. Kristin Forbes has long dissented in favour of higher rates so her vote today was no surprise. 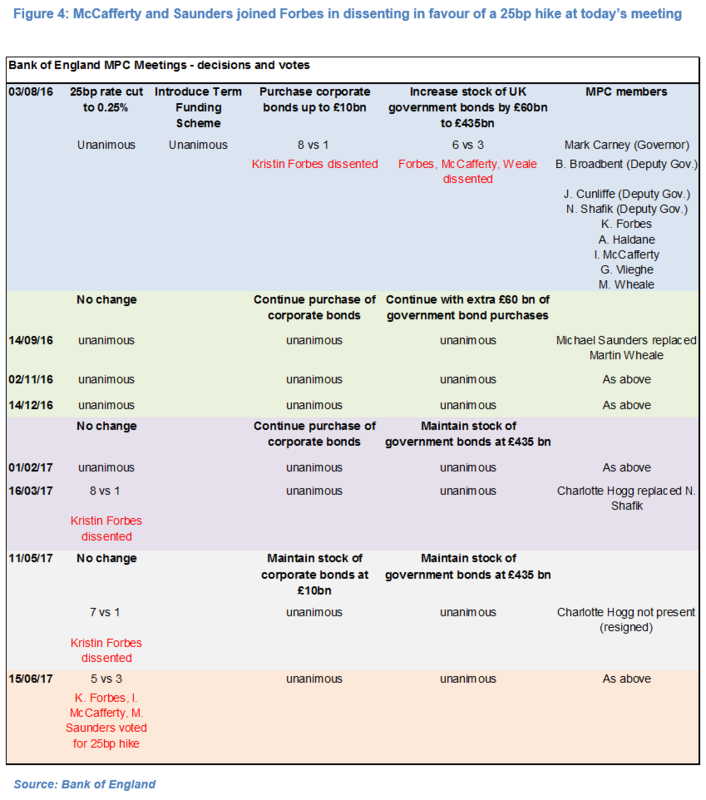 McCafferty is also a hawk, having voted in August 2016 against the BoE increasing its stock of government bonds by £60bn to £435bn (see Figure 4). Saunders, who replaced Martin Wheale (another hawk) on the MPC last autumn, is regarded as a “dovish hawk”. In order for the MPC to vote for a hike, either (i) Governor Carney would have to join the three hawks – he has the casting vote in the event of a four versus four vote – or (ii) two other members would have to switch sides. The likelihood of either scenario is low in the short-run, in my view, which if correct would go some way in eventually cooling market expectations for a near-term rate hike. Falling real wages, a slowdown in bank lending, stagnant property prices, a record-low household savings rate and political uncertainty continue to hold back retail sale volumes (which contracted 1.1% mom in May) and in turn household consumption and GDP growth. Slow economic growth and a still reasonably large pool of available labour (unemployed, part-time workers and those not in the labour force but willing to work) are likely to continue weighing on workers’ ability to negotiate higher earnings and in turn nominal wage growth. Export growth has picked-up but so has import growth, resulting in a still large trade deficit (despite the 18% gain in Sterling competitiveness in the past 18 months) and little support for overall GDP growth. On the supply side, industrial output has for the past 12 months continued to flat-line. While the government may tone down its austerity drive, the scope for generous fiscal reflation remains limited in my view. The receding threat to the future of the EU and/or eurozone is undoubtedly a source of support for the euro in my view. Recent parliamentary elections in France (11th June), the UK (8th June) and the Netherlands (15th March) have served to further dispel the notion, which gained much traction in 2015-2016, that European nationalist parties enjoy great momentum, will reach the highest echelons of power and are on the verge of ultimately shaping the future of the eurozone and EU. The two main pro-Brexit parties in the UK – the Conservatives and UKIP – performed badly in last week’s election. Conversely French President Macron’s pro-EU party is on course to win a significant majority in the 577-seat National Assembly in the second round of voting on 18th June. There is little doubt that in Europe the political, economic and social status-quo is being tested, that nationalism has been on the ascendancy, and that nationalist/populist parties have had greater influence on the political landscape than in the past. However, recent elections further support my long-held view that European nationalist parties are still falling short, failing to cause widely-forecast major political upsets and will in most cases fail to exercise true power, let alone dismantle the eurozone and/or EU (see Nationalism, French presidential elections and the euro, 18 November 2016, and Black swans and white doves, 8 December 2016).